Anwar’s music has been featured in Oscar-winning film Life of Pi as well as The Love Guru. He’s performed across Europe, North America and Asia – and with musicians from a bevy of stylings, including Blues, Jazz, African, Middle Eastern, Japanese and Chinese music. 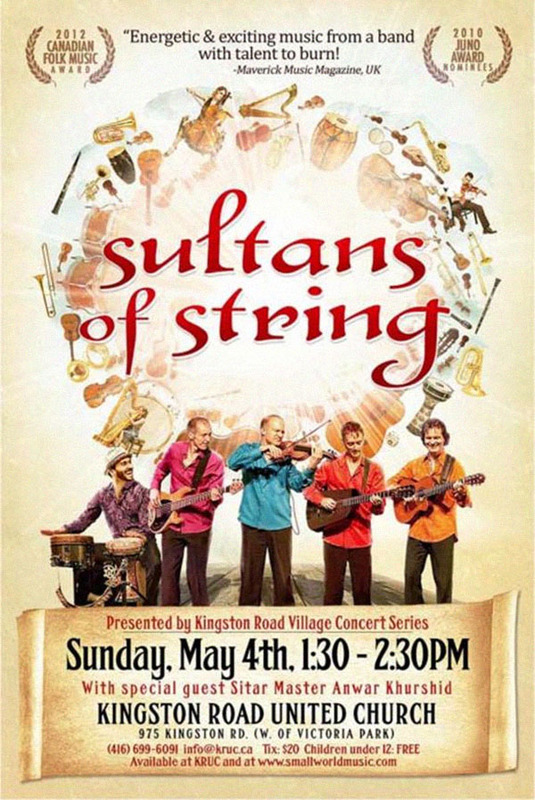 This innovative collaboration with Sultans of String serves up a spicy musical passport that defies categorization. Known for dizzying roots music jams, poly-rhythms and revved up riffs, the Sultans of String sound can’t be pinned down — it’s Sable Island meets the Silk Road, with detours through the Gypsy-Jazz coffeehouses of Eastern Europe, next an East Coast Kitchen Party, then to the bustling markets of Lebanon, not to mention a rumba-flamenca tune about The Arctic! Fiery violin dances with kinetic guitar while a funky bass lays down unstoppable grooves. Throughout, acoustic strings meet electronic wizardry to create layers and depth of sound. Kicking things off as a dynamic duo playing tiny cafes in 2007, this fiercely talented and hardworking indie act has been on a meteoric rise, with an astonishing number of awards and accolades in tow. Invitations to play world stages and with such legendary artists as The Chieftains and David Bromberg are recent highlights. The Chieftains’ very own Paddy Moloney also appears on the band’s brand new CD, Symphony! The band is led by JUNO-nominated 6-string violinist McKhool (Jesse Cook, Pavlo) who grew up in a Lebanese-Egyptian (Makhoul) house bursting with music and diversity. Growing up, Chris was fed a steady diet of delicious musicality alongside Middle Eastern cuisine and violin lessons. 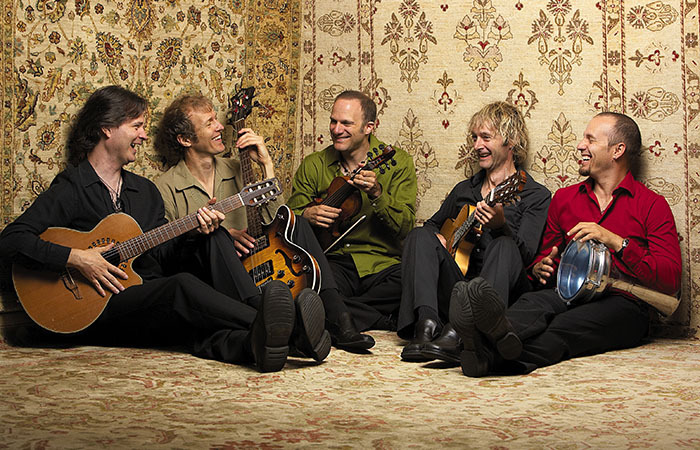 When McKhool first heard founding guitarist Kevin Laliberté’s rumba rhythm, their musical synergy created Sultans of String’s signature sound – the intimate and playful relationship between violin and guitar. From this rich foundation, the dynamic duo has grown, featuring such amazing musical friends as 2nd guitarist Eddie Paton (Robert Michaels), bass master Drew Birston (Chantal Kreviazuk, Amanda Martinez), and Cuban percussionist Chendy Leon (Parachute Club, Alex Cuba), as well as special guests such as folk pop darlings Dala, The Chieftains’ Paddy Moloney, ukulele giant James Hill, and now, internationally recognized sitar virtuoso Anwar Khurshid!